Zara Phillips, the Queen's granddaughter, will compete at this summer's Olympic Games after being named in the Team GB equestrian squad. Phillips, 31, has been chosen along with Kristina Cook, William Fox-Pitt, Piggy French and Mary King in the eventing team for London 2012. It will be her first Olympics after missing Athens and Beijing because her former horse, Toytown, was injured. "I'm so happy to be given this opportunity," said Phillips. Zara Phillips MBE, on board Toytown, won individual gold and team silver at the World Equestrian Games in 2006. They also won the individual and team European titles in 2005 and team gold two years later. "My horse High Kingdom was full of running at his last event and has been improving all the time. We thought we'd have a chance after that performance but it was awesome to actually get the call. Now we can kick on to the Games and I just hope he keeps on getting better." Phillips sealed her place by finishing third on High Kingdom at the Bramham International Horse Trials on Sunday. "When the London bid was announced Trevor Hemmings, one of my earliest supporters, suggested we go out and find a horse to get there," she added. "High Kingdom was that horse. You buy youngsters and it's hard to see their full potential and know how far they'll go. It's great to have another horse that can run at this level. "High Kingdom is a pretty cool, relaxed kind of guy, he's pony-like, a nippy little jumper and easy to manoeuvre, so hopefully it will suit him well in Greenwich. I have a lot of faith in him." Phillips will follow in the footsteps of her mother, the Princess Royal, who competed at the Montreal Olympics in 1976. Her father, Mark Phillips, won team gold at the Munich Games in 1972 and team silver 16 years later in Seoul. 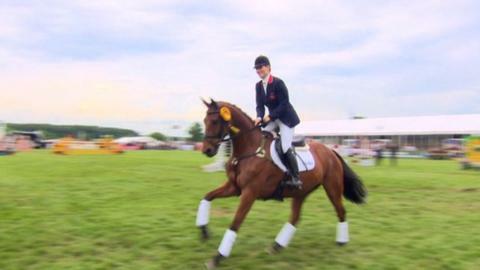 In 2006, she was voted BBC Sports Personality of the Year after winning the Eventing World Championship. Phillips will make her Olympic debut this summer along with Piggy French, while London 2012 will be Mary King's sixth Games, William Fox-Pitt's fourth, and Kristina Cook's second. Cook, Fox-Pitt and King were part of the eventing team which claimed bronze at the 2008 Olympics in Beijing. "It's a great honour and a privilege to be selected for the British team and particularly exciting as it's on home ground," said Fox-Pitt. "I can't wait for the Games to get started; I'm sure the London Olympics will be an unbelievable experience."